Dr. Raymond T. Kolocek passed away peacefully on Saturday January 24, 2015 at the age of 93 with family at his bedside. Ray was born on March 10, 1921 in Virginia, Minnesota. He was preceded in death by his parents, Adam Robert Kolocek and Frances Evelyn (Jambor) Kolocek, brother Hubert, and sisters Evelyn (Lenari) and Leona (Kokal). 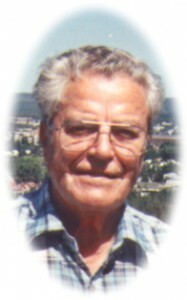 Ray is survived by his loving wife of 70 years Hazel, his six children Angela (Woodrow Hicks) of Elgin, IL, Victoria of Port Washington, Elaine (Joe Weber) of Sturgeon Bay, John (Terri) of Oostburg, James (Linda) of Port Washington, and Ann (Terry Dibert) of Beaver Dam, as well as eight grandchildren, and seven great-grandchildren. Ray proudly served his country in World War II, enlisting in the U.S. Army Air Corps in 1942. He was stationed in Colchester, England, where he was on the Military Police Force (MP), and would lead convoys on his Harley-Davidson in the dark of night. Within five months of service, Ray was promoted to the rank of Staff Sergeant, serving in that capacity until his discharge in 1945. While stationed in Colchester, Ray met the love of his life, Hazel, and the two were married near her hometown of South Woodford in 1944. After his discharge from the Army Air Corps, Ray continued to serve his country, and accepted a position with the War Department during the Allied Occupation of Germany. Ray and Hazel stayed in Germany until 1947, when they returned to the US with daughter Angela. After returning home, Ray enrolled in the Southern College of Optometry in Memphis, TN, where he earned Dean’s List recognition for academic achievement. After graduation, Ray and Hazel moved to Wisconsin where Ray opened his own Optemetric practice, initially in Port Washington and later in Grafton. Ray, known as “Doc Kolocek” to many patients and friends alike, was a practicing Optometrist well into his 80’s. He was a fixture in the community, both as a lifetime member in the Knights of Columbus, serving as Grand Knight for two years and as District Deputy for eight years, as well as actively involved in the local VFW and American Legion, serving at many fish fries throughout the years. Ray sang with the Ozaukee County Chapter of Barbershoppers throughout his many years in Port Washington. He also enjoyed golf and bowling, and was proud of the perfect game he bowled as a member of the Knights of Columbus team, and the hole in one he achieved with weekend golf buddies. A private family service was held at Poole Funeral home, with a memorial mass to follow at St. Mary’s Church in the spring. He is interred at St. Mary’s Catholic Church cemetery in Port Washington, WI. In lieu of flowers a donation can be made in Ray’s memory to the Knights of Columbus or the Veterans of Foreign War. Previous Post: Sauer, Harold W. “Harry”, Sr.
Next Post: Panzer, Ursula H.
Ray and my father “Swede” Czisny were on the same bowling team. Always remembered the bowling team coming over for dinner. Hazel is such a wonderful lady and a dear friend to my mom. Sympathy to all the Kolocek family. Ray was a very kind man who was loved by many. I wonder if there is bowling in heaven I think the whole team is there? Sorry for your loss. Prays for your family. So very sorry for the loss. As a neighbor and friend of son John during my high school years I remember both Ray and Hazel and recall them as both being terrific, fun people. This really jogged my memory and having lost my mom just over a year ago I can feel your loss.